Sinful AKA The Next Historical, is done. Emailed to my editor. Tomorrow I’m going to get a pedicure and a massage. I will resume more regular blogging soon. Yup. Down to the Wire. But the fork will be out soon. Standby for that. There will be a wild celebration after that. Which is, admittedly, not quite yet. In the meantime three pictures I took today when I was out with the camera and said, gee, I wonder what that button does? Oh. I actually kind of hate this flower for some reason, even though it’s pretty. Shrug. It’s cute. And I don’t like it. Things are going reasonably well. Making progress. It occurs to me I haven’t even posted chapter one. I’ll have to do that. Later. This one is from October. I think the gopher got this rosebush shortly afterward. Frown. There are now two rosebushes to replace. Hey, Look at the Pretty Pictures! Deleted 1500+ words today. Sigh. Still, progress is being made, seriously. Even prettier in real life. This is from last May. Posted in Books | Comments Off on Hey, Look at the Pretty Pictures! Not Freaking at all. Why do you ask? Hi. Still writing. There is hope for this. Here’s a picture I took for you to admire or whatever while I’m busy. I can see already the blogger pic doesn’t show the awesomeness of my new macro lens. 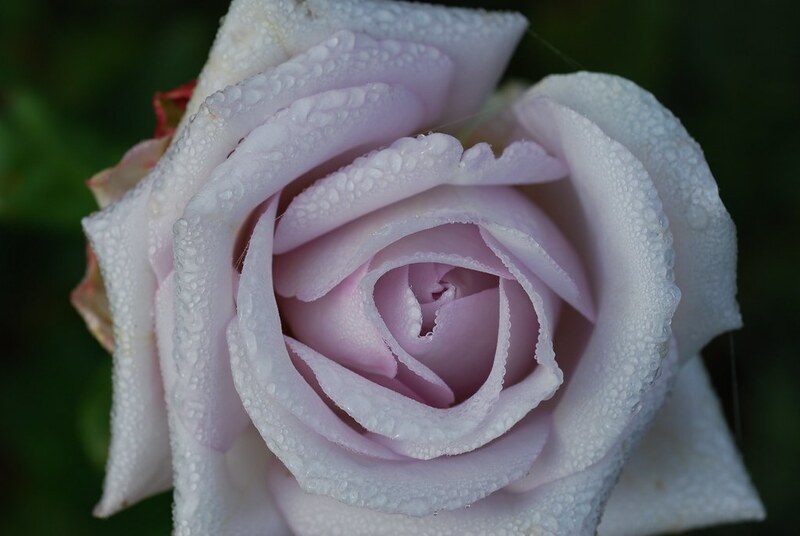 So here is a link to the photo on Flickr so you can check out the dewdrops just balancing there on the rose petals. Posted in Uncategorized | Comments Off on Not Freaking at all. Why do you ask? Just a quick update. The Next Historical is going along. I’ve reached a part where I need to do some fixes of chronology and/or geography or risk a ripping massive hole in the time-space continuum. I’m not quite sure what to do, but suspect a very simple solution is out there, just out of reach and if I push too hard, it will blow up. But if I don’t push hard enough, well, there goes the universe! You see my dilemma. If you-all were on Twitter you’d already know about the Regency Zombies storming Almack’s and having tea. No. I am NOT procrastinating. I think I need to make cinnamon rolls today. Back to saving the world! Oh. I think I thought of the solution. And the crowd goes wild!! Yes, it was simple. I’m still going to make cinnamon rolls though.